For three decades Ridgefield Press readers were treated to the usually light-hearted columns of Duncan Smith, a journalist who spent 75 years turning out news and opinion, much of it for the Chicago Daily News. Duncan MacMillan Smith was born in Illinois in 1863, one of 10 children of farming immigrants from Scotland. He began his newspaper career while still a teenager, writing a column called “The Cornfield Philosopher” for a local weekly paper. He was eventually hired as editor of a nearby weekly, and soon started his own in Seward, Ill., called The Blue Valley Blade. He moved on to work for a paper in Nebraska where he met and married school teacher Grace Woodward, and then bought a weekly in Indiana. Offered a job at the Chicago Daily News, he grabbed the opportunity and wrote for that paper for 20 years, including penning a well-known column called “Hit or Miss,” which eventually became syndicated. Many columns employed verse, not surprising since among his circle of friends were poets Carl Sandburg and Edgar Guest. He left the newspaper business in 1912 to become a press representative for the new Populist movement in Minnesota and the Dakotas, but was soon back at the typewriter, buying the Rockford, Ill., Republican, a daily in the town in which he was born. When his wife died in 1929, he moved to Ridgefield to live with his daughter, Margaret, a novelist who wrote under the name of Peggy Shane and who was married to humorist and writer Ted Shane. Here, he turned out a column called “A Birdseye View” almost every week for 30 years for The Press and eventually its sister publication, The Wilton Bulletin. will come for a simple paging. or started on this column. 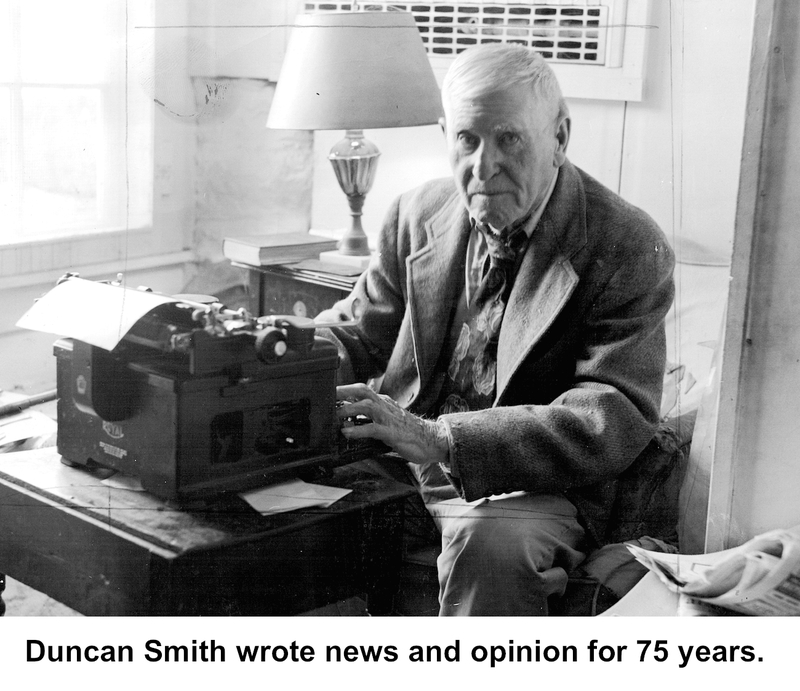 Duncan Smith died in 1956 at the age of 91.